Judge Bernie Stephenson on Friday slapped Edward 'Al Capone' Green with a sentence of 25 years in prison. She then reduced that term by five years, the period that Green spent on remand at the Stock Farm prison. 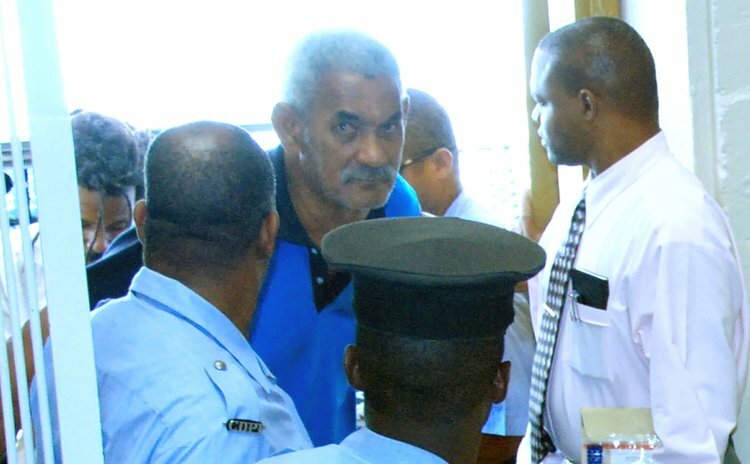 In July, a jury found Green, 72, of Morne Daniel guilty of the murder of Damian Dorival, 35, of Roseau in 2008. The jury returned their verdict, one absorbed quite calmly by the gallery, on Wednesday July 17, 2013 at 4:35pm at the Roseau High Court. The case, which begun on June 17, 2013 had gone on for 12 days over five weeks. The jury heard evidence from 30 witnesses including one by the defence, listened through more than six hours over two days of addresses (by Keith Scotland for the prosecution and Darius Jones for the defence, and summation of the evidence by trial judge Stephenson); then after three hours of deliberation the jury decided that Green was guilty of murder. After the verdict, Justice Stephenson scheduled sentencing to Friday, September 6, 2013 but for various reasons it was not held until Friday last week. She had ordered psychiatric and social inquiry reports and submissions from the defense to be submitted to the court on or before Monday, August 26. At the trial, Green did not have to make a defence. His position is that he is innocent. Before the verdict, as he addressed the court from the Prisoners' Dock for about 55 minutes, Green gave an outline of his daily routine.